Learn more about the classes we offer, our goals, and the band director! Concert Band is the primary component of the band program. Students are placed according to their skill level and experience. Our bands perform a fall, winter, and spring concert and participate in the annual district assessment (Music Performance Adjudication). Students in the concert band program also have opportunities to participate in Solo/Ensemble MPA and All-District/State Band activities. 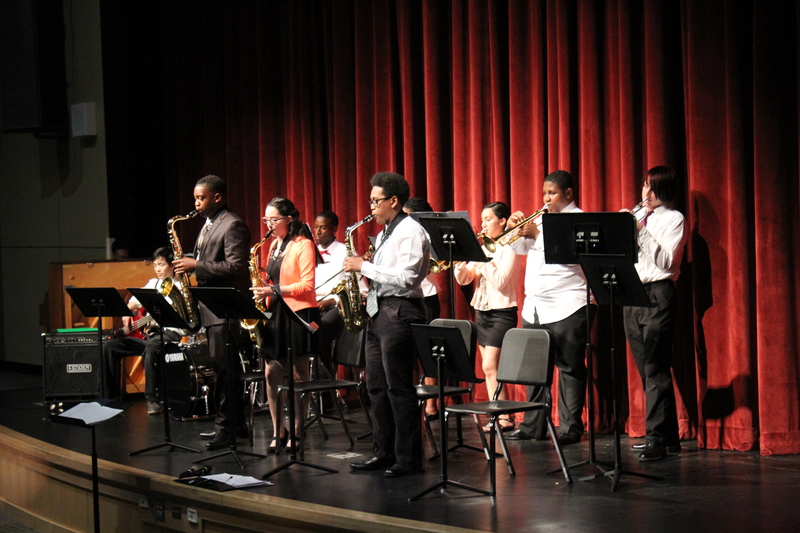 Jazz Ensemble is a class that prepares and performs music in styles such as swing, rock, funk, blues, and Latin. 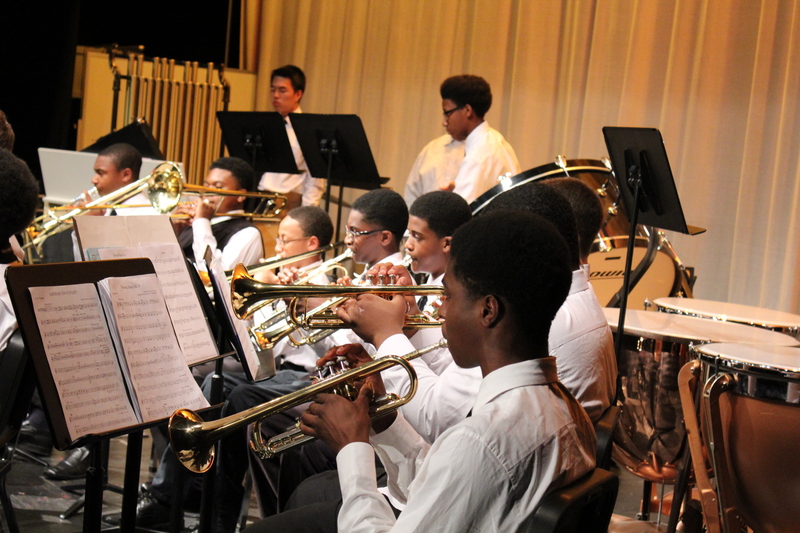 Students learn the basics of improvisation as well as developing advanced strategies. Instrumentation includes trumpets, trombones, saxophones, piano, electric bass, drum set, and guitar. Students must be performing at a “proficient” level. Approval of the band director is required for enrollment. The Marching Mavericks is composed of a wind ensemble, drumline, and color guard. Students in the marching band develop skills and friendships that will last a lifetime. Students wishing to participate must register before each season during the Spring. The Outstanding Band Student Award is presented to students who meet the criteria below. Students must play the performance component with consistent accuracy of notes, rhythms, tempo, characteristic tone, intonation, and musicality. Students meeting these criteria will be awarded the Outstanding Band Student plaque and certificate. 1. Complete at least three years of the Concert Band program and at least three seasons of marching band. 2. Log in at least twenty (20) hours of assistance with the Ridge Road Middle School (or other middle school) Band. 3. Participate in the District Solo & Ensemble MPA for at least two years. 4. Play major scales (and arpeggios) and chromatic scale as specified in the All-District Band requirements for grades 9 & 10 (four-minute time length). 5. Submit a two-page, typed (double-spaced) essay documenting the following actions that you have demonstrated, benefiting the MCHS Band program: leadership, citizenship, attitude, and attendance. The Gold Musician Award is presented to students who meet the criteria below. Students must play the following with consistent accuracy of notes, rhythms, tempo, characteristic tone, intonation, and musicality. Students meeting these criteria will be awarded the Gold Musician trophy and certificate. 1. Major scales and arpeggios (tongued) as specified in the All-District Band requirements for grades 9 &10 (three-minute time limit). 2. Chromatic Scale (slurred) as specified in the All-District Band requirements for grades 9 & 10. 3. Prepared selection as specified in the All-District Band requirements for grades 9 & 10. 4. Earn a “superior” rating at District Solo & Ensemble MPA. 5. Audition for the All-District Band at the grade 9 & 10 level. The Platinum Musician Award is presented to students who meet the criteria below. Students must play the following with consistent accuracy of notes, rhythms, tempo, characteristic tone, intonation, and musicality. Students meeting these criteria will be awarded the Platinum Musician trophy and certificate. 1. Major scales and arpeggios (tongued) as specified in the All-District Band requirements for grades 11 & 12 (four-minute time limit). 2. Chromatic Scale (slurred) as specified in the All-District Band requirements for grades 11 & 12. 3. Prepared selection as specified in the All-District Band requirements for grades 11 & 12. 5. Audition for the All-District Band at the grade 11 & 12 level. The Master Musician Award is presented to students who meet the criteria below. Students must play the following with consistent accuracy of notes, rhythms, tempo, characteristic tone, intonation, and musicality. Students meeting these criteria will be awarded the Master Musician trophy and certificate. 4. Earn two “superior” ratings at District Solo & Ensemble MPA. 5. Audition for the All-District Band for two years and successfully participate in the All-District Band Clinic/Performance at least one year. Complete at least three years of the Concert Band program and at least three seasons of marching band. Log in at least twenty (20) hours of assistance with the Ridge Road Middle School (or other middle school) Band. Participate in the District Solo & Ensemble MPA for at least two years. Submit a two-page, typed (double-spaced) essay documenting the following actions that you demonstrated, benefiting the MCHS Band program: leadership, citizenship, attitude, and attendance. dimental Long Roll: (open-closed-open), Orchestral Buzz Roll: (ppp-fff-ppp); Flam (open-closed-open); Single Paradiddle (open-closed-open); Prepared piece. Mallets – Two octave major scales and arpeggios (same rhythms as winds): G, C, F, B-Flat, E-Flat, A-Flat, D-Flat. Two octave chromatic scale beginning on C. Prepared piece. Timpani – Roll: (ppp-fff-ppp); Interval tuning: 3rds, 4ths, 5ths. Prepared piece. Earn a “superior” rating at District Solo & Ensemble MPA. Audition for the All-District Band at the grade 9 & 10 level. Mallets – Two octave major scales and arpeggios (same rhythms as winds): D, G, C, F, B-Flat, E-Flat, A-Flat, D-Flat. Two octave chromatic scale beginning on C. Prepared piece. Audition for the All-District Band at the grade 11 & 12 level. Snare – Rudimental Long Roll: (open-closed-open), Orchestral Buzz Roll: (ppp-fff-ppp); Flam (open-closed-open); Single Paradiddle (open-closed-open); Prepared piece. Earn two “superior” ratings at District Solo & Ensemble MPA. Audition for the All-District Band for two years and successfully participate in the All-District Band Clinic/Performance at least one year. For the Mallard Creek High School Band program recognized as one of the top band programs in Charlotte. Build the band enrollment to support two full concert bands, jazz band, and 80-member marching band. Increase the quality of each band to a “superior” level as rated through the District MPA (Music Performance Assessment). Provide leadership opportunities and experiences for students. 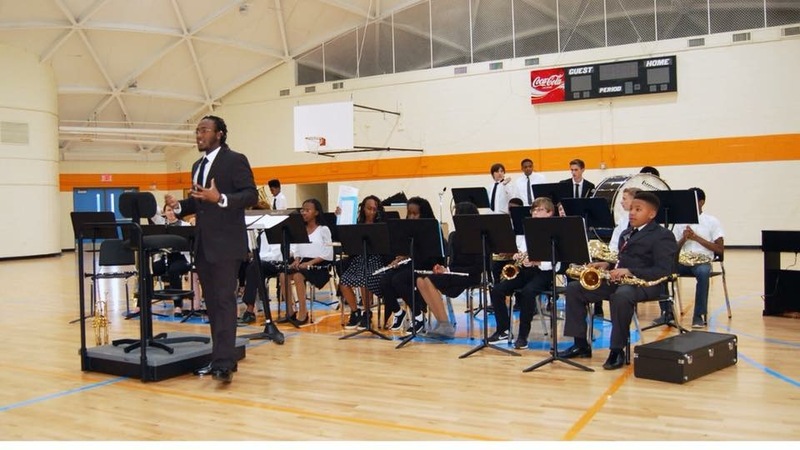 Provide opportunities for students to participate in All-District/State band activities. Provide opportunities for students to be assessed at District Solo/Ensemble MPA. Provide assistance to students wishing to pursue further music instruction at the college/university level. Tyler Curbeam is a 2016 Graduate of Winston-Salem State University, holding a B.A. in Music with a concentration in Percussion. During his time at WSSU, Mr. Curbeam participated in multiple organizations that enhanced his leadership, communication, and teamwork skills, including the “Red Sea of Sound” Marching Band and Kappa Kappa Psi National Honorary Band Fraternity. 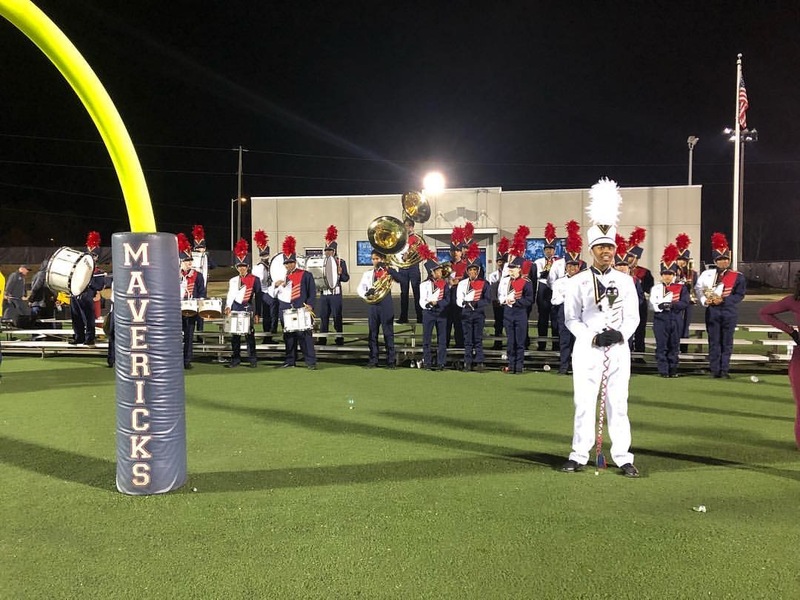 Mr. Cubeam has been working with the Maverick Bands of Mallard Creek High School since 2017. He enjoys developing prominent musicians out of today’s youth, teaching them how to advance their current musical ability, and inspiring them to take to to reach new heights. Volunteer with the Marching Mavericks! In compliance with Federal Law, Charlotte-Mecklenburg Schools administers all education programs, employment activities and admissions without discrimination against any person on the basis of gender, race, color, religion, national origin, age or disability.